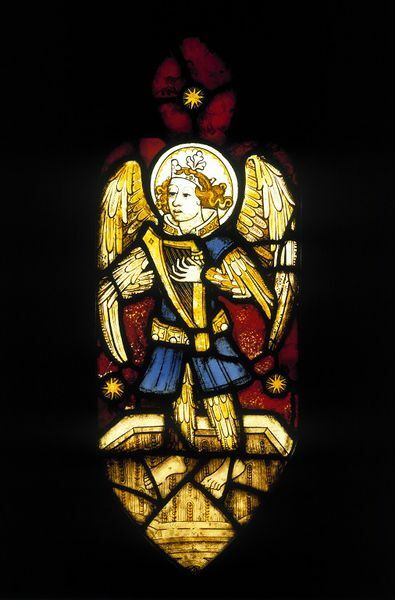 This panel depicts a feathered angel playing a harp - a motif thought to be derived from medieval mystery plays. These vernacular dramas, which enacted biblical tales such as the Creation and the story of Adam and Eve, were performed all over Europe in the Middle Ages. In England, guilds of performers toured the countryside with their 'pageant wagons', the actors playing angels wearing 'pyjama suits' covered with feathers. 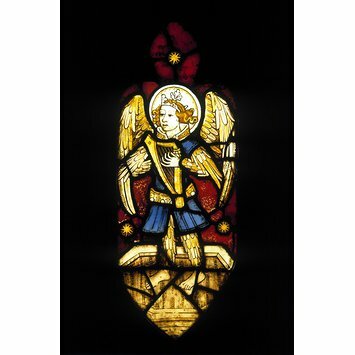 Panel (tracery light with trefoil top). An angel playing a harp. Ruby. Blue. Black. Silver-yellow. Lower portion restored in pale pinkish glass. Set in a rectangular panel of modern quarries of clear glass.